Bergverlag, a publisher of paper booklets available at the local Bahnhof (train station). The booklet I used was titled Hüttenführer 2013. Our rental apartment had several Bergverlag booklets on different topics, and the landlady advised us where to get copies. These are German-language booklets. I had read online that reservations were not necessary to stay at the alpine huts. My German is not great, so I was reluctant to call ahead to make a reservation. (With marginal language skills, face-to-face conversations are easier to negotiate than over a telephone.) I had no international cell phone, anyway. So, I was testing the “no reservation needed” concept. My plan was to show up early, reserve a room, then hike up to Schönbichler Horn (3,133 Meters), and then return for dinner and to spend the night. My day did not work out that way, though! Mark drove me to the trailhead at the Gasthaus Breitlahner. Mark was not feeling up to this hike, so he stayed in the Zillertal valley and spent the day visiting the local churches. I hiked up the valley, past the Grawandhütte and Alpenrose Hütte to the Berliner Hütte. I arrived at the Berliner Hütte too early to sign up for a room–or so it seemed. When I arrived at 9:30 AM, no one was at the desk, and all the staff was busy cleaning the place. A sign at the desk said something about rooms being available at 1500 Hrs (3:00 PM). Perhaps if I had asked the right person, I could have gotten my name on a list? I set off on the Berliner Höhenweg trail towards Schönbichler Horn at about 10:00, without having made a room reservation. About 5 minutes later, I missed a turn on the trail because I was talking into the darn camera about how I wanted to make good time (oh, the irony). I ended up on the wrong trail, and hiked to the foot of the Hornkees glacier. I think that I really should have noticed much sooner that the trail was so poorly defined and the red and white trail marks were missing. By the time I got back on the correct trail, I had lost a couple of hours on my detour. I was getting tired, the clouds looked threatening, and I was worried about not having a room. So, I turned back towards the Berliner Hütte without having reached a 3,000 Meter peak. Dang. I arrived back at the Berliner Hütte at about 2:00 PM. The place was much more busy now, compared to 9:30 AM, with much activity on the terrace and the dining room. The front desk was still closed, but I noticed a line of people forming at a table in the dining room. I got in line. The room-lady informed me that no rooms were available, but I could put my name on a waiting list. She assured me that even if no room opened up, I would be able to sleep in “Notlager” (emergency space). She said I would have to wait until about 5:00 PM to find out about a room. So, I waited out on the terrace, and had a huge plate of eggs and bacon for dinner. About an hour later, the very busy room-lady found me outside and gave me the news that she had assigned me a private room. Great! I am glad to have gotten a room. But, I still don’t understand the system for reserving a room. Maybe someone cancelled their reservation, and I was just lucky? If my German were better, I would have asked more questions. The cost for the private room was 26 Euro. If I had to do it over again, I would make a reservation in advance rather than go through the uncertainty. It was an interesting and worthwhile experience to get a taste of the alpine hut system. 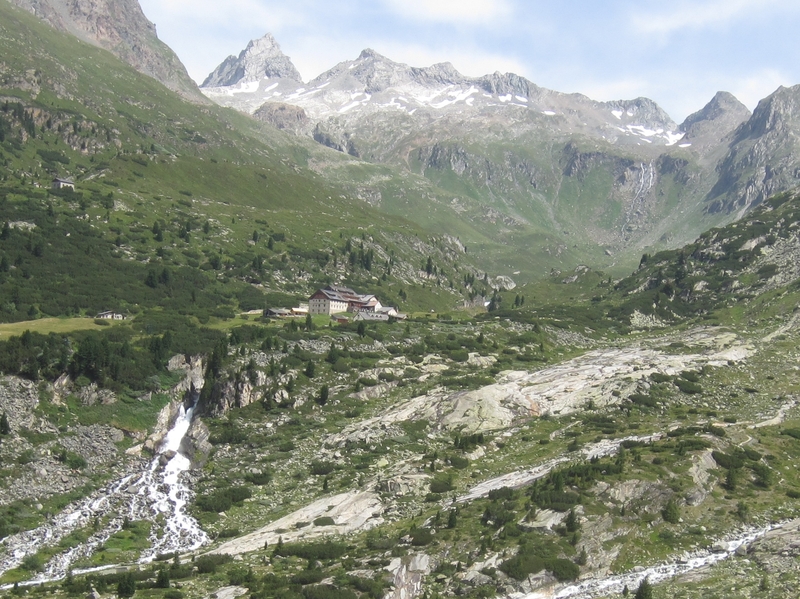 If I ever go back to Austria again, it may be for a week-long hut-to-hut hiking tour. Next time, I’ll plan my route better! 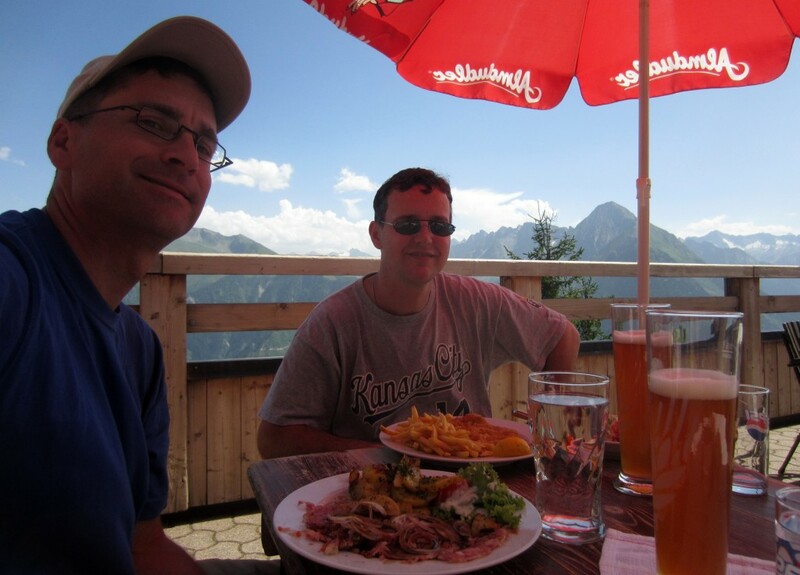 This was the second day-hike of my Austria Summer vacation with Mark. Our rental apartment was in Stummerberg in the Zillertal valley. So, we drove about 25 minutes down the valley to the town of Mayrhofen. From Mayrhofen, we took the Penkenbahn cable car, and the Kombibahn Penken, to the top of Penkenberg. At the top, we stopped for a few minutes to watch a para-sail launch. We hiked several miles along the ridge on well-defined trails, enjoying the scenery, people-watching, and plenty of opportunities for dining! Our first dining break was at the Panorama Restaurant, for a cappuccino and Germknödel with vanilla sauce. What a treat, after only about 30 minutes of hiking! The Penken recreation area is popular and had people of all ages: children, families, young and old. We must have seen a dozen or more para-sails during the day. We also saw rock climbers, mountain bikers, and people riding interesting apparatus down the trails. One vehicle new to me looked like a mountain-tricycle. Another new one (to me) looked like a scooter with larger wheels, and the rider stands on it with feet parallel to each other and pointed straight ahead. We hiked past the Penkenjochhaus (another gasthaus/restaurant), and followed the road to the Wangl Alm. At this point, we were considering hiking down to Vorderlandersbach and taking the bus back to Mayrhofen. However, Mark was feeling some pain in his hip so we took the more-level trail back the way we came, and rode the lifts down. For dinner, we stopped at the Gschlösswandhaus. This gasthaus is near the middle station, where the Penkenbahn cable car and Kombibahn meet. it is relatively new, and built on the side of a cliff. I had Haussülze and Mark, Wienerschnitzel. We both had Zillertaler Weissbier. At the end of our week, Mark selected this meal as his best of the week–the Wienerschitzel was thinly-cut and the breading light and crispy. Back in Mayrhofen, we walked around and explored the town a little, including a visit to the local church. On the way home we stopped for groceries and to fill the car with gas. 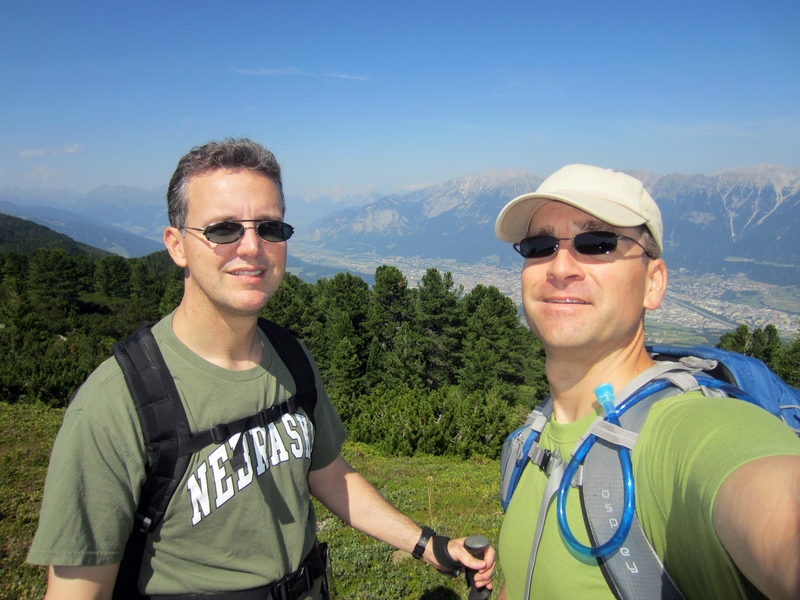 This hike was near Innsbruck, Austria, during a Summer vacation with my former college roommate Mark. We started in the town of Igls with a cable car ride on the Patscherkofelbahn. Then, hiked the Zirbenweg (Zirben path) in an easterly direction across to a chairlift which took us back down to the valley. A bus ride returned us back to the parking lot. The hike offered great views of Innsbruck and the Inn valley. 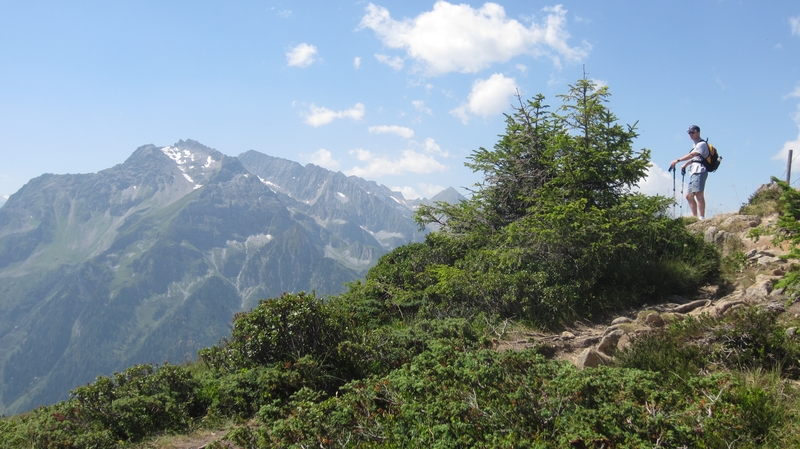 The trail is named after the Zirbe, which is a type of pine tree (“Swiss Pine” in English). The wood is desirable for furniture and carving. And, the pine cones are used to flavor schnapps. The chairlift ride down was a real moment of joy for me (Mark said it was for him as well). The views were breathtaking. Thank you, Frau Horak, for recommending this hike to us! More blog posts will follow with additional Austria hikes. Note, the purple flowers in the video are not Enzian as stated. I think they are Harebell.